FMS Seating (BOOTH #36) to feature the best in executive and luxury seating at the Atlantic City Limo Show (LCT East), November 5-7 at Harrah's Resort Atlantic City. LCT/NLA Show East offers the limousine industry a complete trade show marketplace, networking forum and educational sessions ideal for limousine operators nationwide and based on the East Coast. It marks a new era of LCT industry leadership on the East Coast. 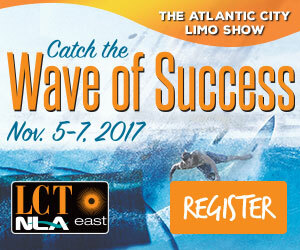 Built on the legacy of the longstanding LCT brand, LCT/NLA Show East is proud to return to its East Coast roots. The full schedule offers a top-notch educational program hand-crafted by the NLA, the coolest networking parties and a huge exhibit floor packed with the latest vehicles, technology and products. New Italia and Messina coach style armrests! New armrests feature a coach-style design to accentuate your executive seats by FMS and Freedman Seating. The matching Messina armrest is perfect for in between seats or against the vehicle wall. Both armrests are available in wood grain, carbon fiber, and solid black or gray. Trieste 3PT Experience the utmost in luxury, comfort, and style. The Trieste seat is available with several different insert styles and upholstery materials, allowing you to customize the look that best fits your needs. 'Bellagio 3PT Designed to fit the needs of the executive shuttle market, the Bellagio is available with both rigid and reclining backs, in a variety of seat widths and insert panel styles. Deep bolsters hug you into the seat, providing the ultimate in passenger comfort. Let all customers experience the look and feel of first class with the Bellagio. Palermo 3PT Introducing the newest addition to the popular Eleganza Collection, the Palermo seat serves your economical needs without compromising style or comfort. The executive line by FMS includes the market’s most complete seating solutions with luxury and safety at the forefront of its design and engineering. Napoli Experience the latest in executive seating by FMS. Available in both rigid and reclining backrests, the Napoli comes standard with adjustable headrests, Eleganza leatherette vinyls, and optional contrasting style lines. Sporty, stylish, and luxurious, The Napoli provides maximum comfort to all passengers. The exhibit hall will be the epicenter of energy, fresh ideas, new and pre-owned products and and all-around great place to hang out. With exclusives no one else offers like happy hours and the Center Lounge, you'll find it hard to get it all done in one day.